There are many luxury concierge services that will let you live "Entourage" level excess at a price. As the official travel and hospitality partner of Funksion: Fashion Week Miami Beach, one luxury concierge found its perfect audience in one of fashion's elite events. But going one step further, Fame Route is putting some unique support behind the American Heart Association's 2nd Annual Red Dress Fashion Show, which benefits Go Red for Women. Departing October 15th from New York City, Fame Route will privately transport a couture collection of red dresses designed by some of the world's top fashion designers in one of its elite private aircraft to ensure their safe arrival for the American Heart Association 2nd Annual Red Dress Fashion Show scheduled October 16th in South Beach, as part of Fashion Week Miami Beach. Accompanying the dresses will be several VIP media guests as well as celebrity designer Richie Rich and designer legend, Nicole Miller. What is Fame Route anyway? The new company positioned somewhere between value (commercial) and ultra luxury (private) travel coins itself an "all-purpose luxury membership service" offering three distinct client services: Concierge 360, Charter Jets, and Luxury Motorsports. The company's Concierge 360 includes - upgrades at 5-star hotels such as Hotel Bel-Air and Mandarin Oriental in San Francisco, priority seating without reservation at top dining spots, and entrance to marquee VIP events throughout the U.S. 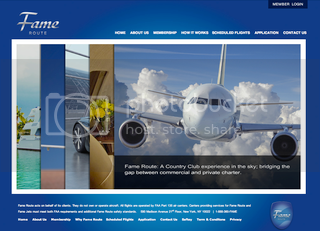 Fame Route’s monthly membership cost is $1,000, in addition to a $500 dollar annual surcharge, and each round trip flight costs between $3,500 and $5,000 dollars netting out at roughly $17,000 for an annual membership. "Fame Route is delighted to support the Red Dress Fashion Show and offer our membership service to a cause that deserves red carpet attention," Gil Peter, Chairman of Fame Route, said. "We trust our guest passengers will enjoy our unparallel service and share in our belief that it's about time someone introduced an idea like this into the marketplace." Fame Route's sponsorship coincides with the launch of its services between Los Angeles, Las Vegas, New York and Miami. Joanna Palmer, American Heart Association Go Red For Women Director said, "Having our red dresses grace the skies on a Fame Route flight along with esteemed designers Nicole Miller and Richie Rich is both a thrill and a gift. We want our potential bidders to appreciate the care and value of the journey these one-of-kind dresses took to get here and hope that is reflected in the value of the bids we receive and funds we raise for our cause." As Matt Damon demonstrated in last Sunday's Entourage finale, with fame comes philanthropy. Have you thought about your own unique ways to tap into the luxury travel and concierge category through sponsorship?